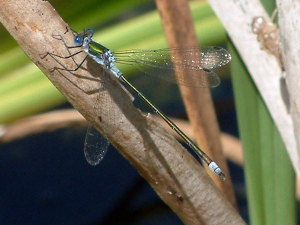 Observation - Emerald Damselfly - UK and Ireland. Description: Almost dismissed these as slightly odd blue-tailed damsels, but the angle of the wings made me look again. Almost dismissed these as slightly odd blue-tailed damsels, but the angle of the wings made me look again.